Homemade Hamburger Buns – Classic & Big Mac “Club” – Just One Bite, Please? Why make your own Hamburger Buns when you can just go to the store and buy them? The recipe for my Homemade Hamburger Buns came out necessity. I wanted to recreate “Big Macs” at home but couldn’t find store bought buns that would work. Either too small or too big. All of which had loads ingredients that I don’t have in my pantry or want to feed to my family or friends. I wanted a bun that could hold up to my vision of a “Big Mac Sesame Seed Bun.” Tall enough to split into 3 even layers (the crown, the club, and the heel), sturdy enough to hold up to all fillings, and tender enough to not get in the way of the texture of the 2 beef hamburger patties, special sauce, lettuce, cheese, onions, and pickles. Allowing the marriage of the all the parts to come together for a delightful dining experience. Check out my blog post “Homemade “Big Mac” – Including the Special Sauce! to make your own. The ingredient and their proportion is key to creating a Hamburger Bun that has right flavor, texture, and body. I recommend with all baking recipes to use a scale to weight out the ingredients. That insures your success when baking. Also note: “THIS IS A STICKY DOUGH!” So don’t panic and add any extra flour. 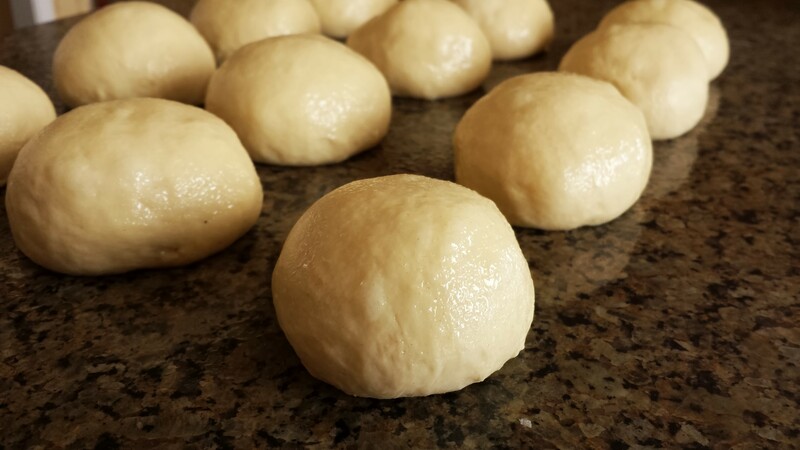 The dough will develop strength as you knead, stretch, and fold it. I looked for baking forms for the Big Mac “Club” Bun online. All were too small and cost way to much for this endeavor. Luckily there is “YouTube.” After some research I found “ChefSteps” YouTube channel which showed how to make your own Aluminum Foil Forms. Click here to check out their video “Foil Rings.” Making my Foil Rings taller and larger in diameter to hold the 125 grams of dough. I also lined the Aluminum Forms with Parchment Paper Collars. Making it easy for the buns to release from the pan and forms. Oh, yeah! I almost forgot. I have a video for you to follow this time. This is my first “YouTube” instructional video on my “Just One Bite, Please?” channel. Please check it out, let me know what you think, and give it a thumbs up if you “Like” it.” The video is below. In the mixing bowl combine the water, instant yeast, whole milk, canola oil, eggs, granulated sugar, and half of the bread flour. Using rubber spatula, stir the ingredients together until it forms a thick batter. Add the remaining bread flour and sea salt mixture to the mixing bowl and fold the ingredients together until the dough become a shaggy mass. Scrape down the spatula and the sides of the bowl with a plastic scraper. Scrap the dough out of the bowl and on the work surface. The dough will be sticky. Do not add any flour to the work surface while kneading. Knead the dough with one hand while using your plastic scrape to gather the dough from the work surface and your hand. Kneading for 4 minutes to incorporate the ingredients and develop the gluten. After 4 minutes of kneading the dough will be strong enough to start stretching and folding using the plastic scrape. Stretch and fold the dough for 6 – 8 minutes or until the dough become smooth and elastic. The dough should be strong enough to pull away from the table in one piece. The dough will be slightly sticky at the end of the kneading process. Lightly spray or coat the mixing bowl with vegetable oil. Form the dough into a ball and place into the oiled mixing bowl. Turn the dough over in the oil to lightly coat the dough. Cover with plastic wrap and let ferment for 1 hour at room temperature 70°F-76°F (21°C – 23°C). The dough will grow 1 times the original size. Uncover the bowl and turn the dough onto a lightly oiled work surface. Fold the dough in 3rds from top to bottom and left to right. Place the folded dough back into the bowl that has been light sprayed or oiled. Lightly spray or oil the top of the dough. Cover with plastic wrap and let ferment for 1 hour at room temperature 70°F-76°F (21°C – 23°C). The dough will grow 1-½ times the original size. After 1 hour. Uncover the bowl and turn the dough onto a lightly oiled work surface. Deflate the dough lightly with your hands. Using a bench scraper divide the dough into 12 pieces each weighing 125 grams. Shaping each piece into a tight round ball, place on a lightly oiled surface and lightly coat the tops with oil, and loosely cover the dough with plastic wrap. You can use a half sheet tray for this step if you don’t have the counter space. After 15 minutes, uncover the rounded dough and lightly sprinkle the tops with flour. Reshape each bun into a tight round and place 6 buns on to a half sheet tray that has been lined with parchment paper. Leaving at least 4 inches of space between the buns. For Big Mac “Club” Buns Aluminum Forms click this link to the video. Making each ring 1-½” tall by 4-½” diameter (4cm x 11.5cm). Evenly space the Aluminum Forms on the parchment paper and line each form with a parchment paper collar. Place the remaining 6 buns into each form. Lightly spray with oil and loosely cover with plastic wrap. Proof the Hamburger Buns for 1-½ hours or until tripled in size. Using a pastry brush. Lightly brush each Hamburger Bun with water. Sprinkle the tops evenly with Sesame Seeds. Bake the Classic Hamburger Buns first. Leave the Big Mac “Club” Bun on the counter uncovered. Bake at 375°F (190°C) for 14 to 16 minutes or until the tops are golden brown. Turning the pan if necessary to get even browning. Remove the Classic Hamburger Buns from the oven and place on a wire rack to cool. Bake the Big Mac “Club” Buns next. Cool the Hamburger Buns completely before using. The Hamburger Buns can be eaten fresh or store cooled Hamburger Buns in a airtight plastic bag at room temperature for up to 2 days. The Hamburger Buns can be frozen in a airtight plastic bag for 2 months. Thaw the Hamburger Buns in the airtight plastic bag at room temperature. Split and griddle each Hamburger Bun before using. Big Mac “Club” Bun is split twice before griddling. This creates the crown, the club, and the heel. Homemade “Big Mac” – Including the Special Sauce! It’s the best recipe for hamburguer buns I’ve ever baked. It’s perfectly spongy, soft and moist. Highly recommend. Thanks! Hello Gabriel, Congratulations on your baking success! It wonderful to hear about your experience making this recipe. Thank you for taking the time to share your experience with us. Have a great day! Hola Hector, ¿tus bollos se volvieron suaves y tiernos con la harina adicional que agregaste? Excellent recipe! Very good explanation step by step. (this is the 3rd time I comment because does not appear before) The only point I have done the recipe and the “big mac” buns didn´t get as highest as yours. Maybe i is necesary more time resting before cooking? Thanks a lot! Excellent recipe! Best in the internet. I followed all the steps, very clear explained, softy bread! Great recipe! Already made It. Thanks for sharing all the steps, including the moment when seems to add flour but it is neccesary to wait. Greetings from Buenos Aires, Argentina!